This recipe has a Swedish origin. Everyone loves these potatoes. Crispy on the outside, slightly soft inside. Delicious! Slice the potatoes into thin slices, leaving a 1/4 inch on the bottom so that the potato is still intact. Place on a baking sheet lined with foil or parchment paper. 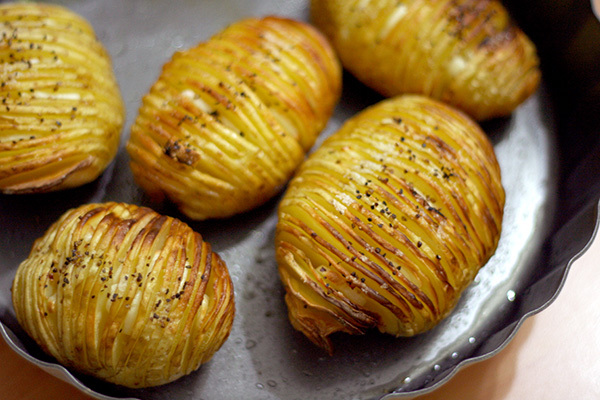 Brush each potato with the butter and oil and sprinkle with salt and pepper to taste. Bake until crispy and tender, about 60 minutes. You can sprinkle with chives and Parmesan cheese when removed from oven if desired. EXCELLENT recipe! Enough butter/oil sauce for several more potatoes. Froze the extras and that worked very very well too! Thawed out several and heated on a cast iron skillet with eggs for Sunday breakfast and they were easy to work with, tender and delicious!